I thought I'd post a quick update about my attempts to start a Speculative Fiction Book Club in Cardiff. You can look at the registration / voting form results in an online report. It has colourful charts! (Not sure if it updates "live" - i.e. the data could at times be a little behind). After Lock In's early lead, The Invisible Library has caught up and is now neck-and-neck with Lock In! I've had some flyers made, which I am putting in booky places around Cardiff today (Monday, 26th Jan 2015). See above for what the flyers look like. As I don't have professional software on my home PC, I had to resort to MS Word to create it, so please don't judge it too harshly! I'll email those who indicated they can't make it but would still like to join today or tomorrow, to figure out what the best options are. I'll send out a proper email update to everyone who registered by the end of this week. In the meantime, I'm grateful for any and all assistance with spreading the word, whether on Twitter, Facebook, or everyone's own blogs. 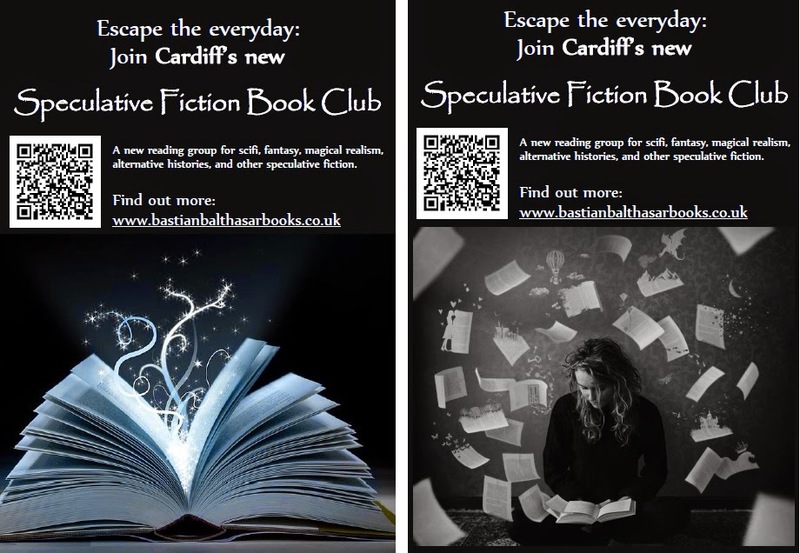 I've also been contacted by two people who let me know there is already a Speculative Fiction Book Club in Cardiff, which has been running for seven years. I'm still going ahead with my attempt to start a new one: I think it's nice to start up something with an entirely new group where no one feels like an outsider as everyone is equally new. So far, it looks like there may be enough people interested for a brand new book club to work. However, if this attempt should flounder, or if the date we ultimately settle on for meetings does not suit you, it's good to know that there is another option that people can join (they do accept new members). The other book club meets "around 7ish in the Rummer Tavern on the 1st Wednesday of the month. The next meeting is February 4th, and the book is Ancillary Justice by Ann Leckie". I've just realised that recent plans mean I can't attend either of the already planned dates. Gah. I need to learn to keep a diary! Well, at the end of the week I'll send out an update which will include another doodle to see if there's some optimum date that is better than the two I suggested. There are a few people who could make Sundays, but can't make Tuesdays and vice versa, and at least one person who can't make either date. We'll see how it goes. A SF/F Book Club for Cardiff?